Two AFC Central rivals, the Cleveland Browns and Cincinnati Bengals, met in a 1993 opening week contest on September 5. Both teams were in a rebuilding mode, with the Browns having gone 7-9 in ’92 and the Bengals 5-11. Cleveland was beginning its third year under Head Coach Bill Belichick and had been active in signing veteran free agents such as QB Vinny Testaverde, WR Mark Carrier, and G Houston Hoover on offense and DT Jerry Ball and CB Najee Mustafaa on defense. They had also drafted an offensive lineman in the first round, Michigan center Steve Everitt. Still, the starting quarterback was Bernie Kosar (pictured above), in his eighth year with the club, and there were talented veterans on the tough defense that included DT Michael Dean Perry and LB Clay Matthews. The Bengals were a young team with 28 first- or second-year players on the roster to start the season. They had a young head coach as well in Dave Shula, son of the legendary Don Shula and back for a second season at age 34. QB David Klingler, the team’s 1992 first-round draft choice who started some late-season games, was now taking over for nine-year veteran Boomer Esiason, who had been dealt to the Jets during the offseason. It was a sunny and mild day with 75,508 fans in attendance at Cleveland Municipal Stadium. The teams exchanged punts to start the game before the Bengals put together an 80-yard drive in six plays. David Klingler completed two passes to WR Jeff Query for gains of 25 and 51 yards. The second was a screen pass in a third-and-nine situation and set up a four-yard touchdown run by RB Ostell Miles. Doug Pelfrey added the extra point. A short series by the Browns resulted in a punt and Cincinnati, benefiting from a 36-yard return by WR Patrick Robinson, again advanced to a score. Klingler completed a third-and-four pass to RB Derrick Fenner for 23 yards to the Cleveland 18 and, after Fenner ran for four yards, two more passes were good to Miles for nine yards and to WR Carl Pickens for a five-yard TD. Pelfrey again converted and the visitors were staked to a 14-0 lead with three minutes remaining in the opening period. The Browns responded by driving 80 yards in 10 plays that extended into the second quarter. 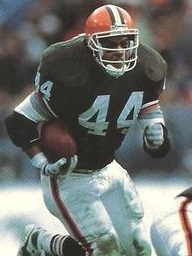 After a penalty on the Bengals gave Cleveland a first down at its own 31, RB Leroy Hoard ran for 12 yards and Bernie Kosar threw to Mark Carrier for 24 yards to reach the Cincinnati 33. Three consecutive completions that included a third-and-six pass to RB Eric Metcalf for 14 yards advanced the Browns to the 15 and, two plays later, Kosar connected with WR Michael Dyson (aka Jackson) for a 13-yard touchdown. Matt Stover’s point after narrowed the score to 14-7. The teams again traded punts until the Browns put together another scoring possession, going 59 yards in 10 plays. Kosar started the series off with a throw to Carrier for 29 yards and had four more completions, setting up RB Tommy Vardell’s one-yard touchdown run with 31 seconds remaining in the first half. Stover again added the PAT and the teams went into halftime tied at 14-14. Cleveland had the first possession in the third quarter and put together an 11-play, 64-yard drive. Vardell (pictured at left) ran effectively, picking up 35 yards on six carries, and while he was held for no gain on a third-and-one play at the Cincinnati 11, Stover put the Browns ahead by three with a 28-yard field goal. It got worse for the Bengals on the next series as a Klingler pass was intercepted by CB Selwyn Jones, giving the ball back to the Browns at the Cincinnati 48. Kosar immediately threw to Carrier for 26 yards but the home team advanced no further and Stover booted another field goal, this time from 34 yards. Following another exchange of punts, the Browns added to their lead early in the fourth quarter when Klingler, who was being sacked for the third straight play, fumbled and SS Stevon Moore recovered and ran 22 yards for a touchdown. Stover’s extra point put Cleveland ahead by a commanding 13 points. Once more the teams traded punts before the Bengals, with 10:25 left to play, took over from their 17 yard line and began to move down the field. Klingler hit on five straight passes, including one to WR Tim McGee that covered 33 yards to the Cleveland 16. A pass interference penalty gave the visitors a first down at the one, but the defense held as three carries by Fenner netted a one-yard loss and on fourth down Klingler fumbled the snap. It was, in essence, the last gasp for Cincinnati. Taking over on downs, the Browns kept the ball on the ground and were finally forced to punt from their 19 with the clock now down to 1:15. There were no last-minute heroics in store and when Klingler threw a pass that Selwyn Jones intercepted, it nailed down the 27-14 win. Cleveland led in total yards (263 to 227), first downs (18 to 12), and time of possession (32:38 to 27:22). The Browns recorded six sacks, to two by Cincinnati, and the Bengals turned the ball over three times, while Cleveland had none. The visitors further were hurt by nine penalties, to five flags thrown on the Browns. 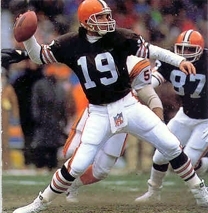 Bernie Kosar completed 18 of 30 passes for 182 yards and a touchdown while giving up no interceptions. Tommy Vardell ran for 60 yards on 16 carries that included a TD while Eric Metcalf, who gained 14 yards on four rushing attempts, had 9 catches for 60 yards. Mark Carrier topped the club with 79 yards on his three pass receptions. 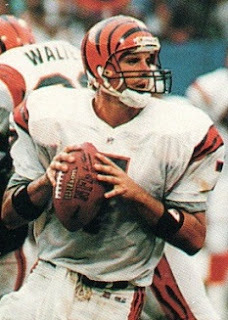 For the Bengals, David Klingler (pictured above) was successful on 20 of 28 throws for 214 yards and a TD, but gave up two interceptions and suffered from being under constant pressure in addition to the sacks. Derrick Fenner rushed for 41 yards on 13 attempts and also pulled in 9 passes for 64 yards. Jeff Query, thanks to the long reception in the first quarter, gained 80 yards on three catches. The Browns got off to a 3-0 start and then, after a 2-3 stretch, Bernie Kosar was released in a stunning move and ultimately replaced by Vinny Testaverde. Cleveland went 2-6 the rest of the way to end up with another 7-9 record and third place finish in the AFC Central. Cincinnati was 0-10 before finally winning three of its last six contests to place last in the division at 3-13. David Klingler continued to struggle, not helped by the deficient offensive line, and ultimately failed as a starting quarterback. While the Browns would turn things around in ’94 with Testaverde behind center, Cincinnati remained in a prolonged funk, with both Coach Shula and QB Klingler falling by the wayside.